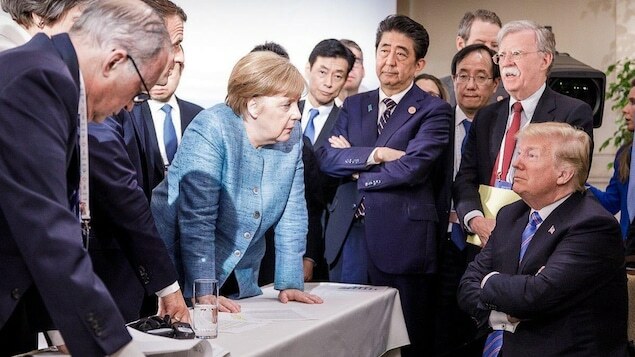 Merkel: "You smug little man, You are stiffing your allies." Trump: "Of course I'm not. Anyway, how many times do I have to tell you? You're just spouting fake news. My hands ARE bigger!" fountainhall wrote: Merkel: "You smug little man, You are stiffing your allies." It wouldn't be any surprise for me if that's exactly what she really did say. "Mr. President, was that you who just unsuccessfully tried to stifle a fart?" Trump: "No,I'm not taking a knee to show disrespect." Bolton: "Can we come to an agreement? Does my mustache need trimming?" Merkel: "Donny, crossing your arms and repeating 'I know I am but what are you' will not solve anything." Merkel: "Donald! Why do you wear such long ties? To cover up your open flies? Always ready for the next Storm(y), no doubt!" I think the high chair mock up is most appropriate and reflects his behavior quite well. Just finished Comey’s book and it is just frightening to get first hand credible accounts of his “leadership” style and thinking. Too Funny and Too Sad at the same time!